On the other end of the planet, a north polar storm is circumscribed by a strange cloudy hexagon that remains fixed in place while 300 mph winds swirl inside it. At the moment, Saturn's north pole is shrouded in darkness because it is winter there, but Cassini's infra-red cameras were able to photograph the vortex anyway by sensing the heat it emits into the night: movie. Researchers think these giant weather systems might powered by deep-seated thunderstorms, although no one can say for sure; the base of the vortices are too deep and cloudy to see. Get the full story from NASA. 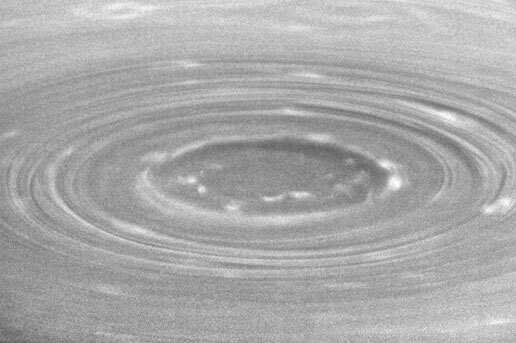 One of the most bizarre weather patterns known has been photographed at Saturn, where astronomers have spotted a huge, six-sided feature circling the north pole. Rather than the normally sinuous cloud structures seen on all planets that have atmospheres, this thing is a hexagon. The honeycomb-like feature has been seen before. NASA's Voyager 1 and 2 spacecraft imaged it more than two decades ago. Now, having spotted it with the Cassini spacecraft, scientists conclude it is a long-lasting oddity. "This is a very strange feature, lying in a precise geometric fashion with six nearly equally straight sides," said Kevin Baines, atmospheric expert and member of Cassini's visual and infrared mapping spectrometer team at NASA's Jet Propulsion Laboratory, Pasadena, Calif. "We've never seen anything like this on any other planet. Indeed, Saturn's thick atmosphere, where circularly-shaped waves and convective cells dominate, is perhaps the last place you'd expect to see such a six-sided geometric figure, yet there it is." The hexagon is nearly 15,000 miles (25,000 kilometers) across. Nearly four Earths could fit inside it. The thermal imagery shows the hexagon extends about 60 miles (100 kilometers) down into the clouds. "It's amazing to see such striking differences on opposite ends of Saturn's poles," said Bob Brown, team leader of the Cassini visual and infrared mapping spectrometer at the University of Arizona. "At the south pole we have what appears to be a hurricane with a giant eye, and at the north pole of Saturn we have this geometric feature, which is completely different." The hexagon appears to have remained fixed with Saturn's rotation rate and axis since first glimpsed by Voyager 26 years ago. The actual rotation rate of Saturn is still uncertain, which means nobody knows exactly how long the planet's day is. "Once we understand its dynamical nature, this long-lived, deep-seated polar hexagon may give us a clue to the true rotation rate of the deep atmosphere and perhaps the interior," Baines said. 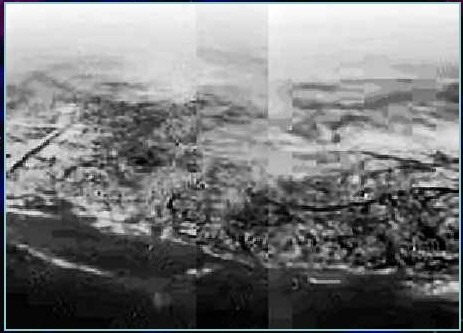 DARMSTADT, Germany - New, refined pictures from Saturn�s moon Titan released Saturday show a pale orange surface covered by a thin haze of methane and what appears to be a methane sea complete with islands and a mist-shrouded coastline. Space officials worked through the night to sharpen the new photos taken by the space probe Huygens, which snapped the images Friday as it plunged through Titan�s atmosphere before landing by parachute on the surface. Many scientists at the European Space Agency center in Darmstadt, Germany, looked tired from their overnight work but were still clearly elated about the successful arrival of data from Huygens the day before � a major triumph for the European space program. Officials played back sound gathered from Huygens� microphone at the surface � a whooshing noise they did not identify. But the center of attention was the pictures. One shot taken from an altitude of 10 miles showed dark lines that suggested stream beds carved by liquid flowing into a dark area suspected to be a sea of liquid methane � with light areas in the dark that could be islands. Titan�s notorious haze � which has kept astronomers from getting a better picture through telescopes � is obvious in the two refined images shown Saturday. An image taken on the surface shows chunks of what scientists say looks like water ice scattered over an orange surface overcast by methane haze. On Friday, the chunks were described as boulder-sized, but overnight examination showed they are much smaller and simply look big because they are close to Huygens� camera. Titan is the only moon in the solar system known to have a significant atmosphere. Rich in nitrogen and containing about 6 percent methane, its atmosphere is believed to be 1� times thicker than Earth�s. �Presumably there is a reservoir of methane on the surface,� Atreya said. The $3.3 billion Cassini-Huygens mission to explore Saturn and its moons was launched in 1997 from Cape Canaveral, Fla., in a joint effort by NASA, the ESA and the Italian space agency. Huygens was spun off from the Cassini mother ship Dec. 24. Titan is the first moon other than the Earth�s to be explored. Scientists believe its atmosphere is similar to that of early Earth�s and studying it could provide clues to how life arose on our planet. The heart of Huygens� mission was its 2�-hour parachute descent, during which it also sampled the atmosphere and deployed a microphone to gather sounds. Today, after its seven-year journey through the Solar System on board the Cassini spacecraft, ESA's Huygens probe has successfully descended through the atmosphere of Titan, Saturn's largest moon, and safely landed on its surface. The first scientific data arrived at the European Space Operations Centre (ESOC) in Darmstadt, Germany, this afternoon at 17:19 CET. Huygens is mankind's first successful attempt to land a probe on another a world in the outer Solar System. "This is a great achievement for Europe and its US partners in this ambitious international endeavour to explore the Saturnian system," said Jean-Jacques Dordain, ESA's Director General. Following its release from the Cassini mothership on 25 December, Huygens reached Titan's outer atmosphere after 20 days and a 4 million km cruise. The probe started its descent through Titan's hazy cloud layers from an altitude of about 1270 km at 11:13 CET. During the following three minutes Huygens had to decelerate from 18 000 to 1400 km per hour. A sequence of parachutes then slowed it down to less than 300 km per hour. At a height of about 160 km the probe's scientific instruments were exposed to Titan's atmosphere. At about 120 km, the main parachute was replaced by a smaller one to complete the descent, with an expected touchdown at 13:34 CET. Preliminary data indicate that the probe landed safely, likely on a solid surface. The probe began transmitting data to Cassini four minutes into its descent and continued to transmit data after landing at least as long as Cassini was above Titan's horizon. The certainty that Huygens was alive came already at 11:25 CET today, when the Green Bank radio telescope in West Virginia, USA, picked up a faint but unmistakable radio signal from the probe. Radio telescopes on Earth continued to receive this signal well past the expected lifetime of Huygens. "Huygens landed at a latitude of about minus 10 degrees at around 165 degrees East," said Michael Bird, Chief Scientist for the Doppler Wind Experiment, "which puts it close to the point on Titan which always faces away from Saturn. So if I were standing right beside the probe I would be on the wrong side of the moon to see Saturn. Just like our own moon always shows one face to earth, it would be as if someone out a probe on the other side of the moon they would never see the earth. The local time on Titan at time of landing would put it close to noon." Huygens data, relayed by Cassini, were then picked up by NASA's Deep Space Network and delivered immediately to ESA's European Space Operation Centre in Darmstadt, Germany, where the scientific analysis is currently taking place. "Titan was always the target in the Saturn system where the need for 'ground truth' from a probe was critical. It is a fascinating world and we are now eagerly awaiting the scientific results," says Professor David Southwood, Director of ESA's scientific programmme. "The Huygens scientists are all delighted. This was worth the long wait," says Dr Jean-Pierre Lebreton, ESA Huygens Mission Manager. Huygens is expected to provide the first direct and detailed sampling of Titan's atmospheric chemistry and the first photographs of its hidden surface, and will supply a detailed 'weather report'. One of the main reasons for sending Huygens to Titan is that its nitrogen atmosphere, rich in methane, and its surface may contain many chemicals of the kind that existed on the young Earth. Combined with the Cassini observations, Huygens will afford an unprecedented view of Saturn's mysterious moon. "Descending through Titan was a once-in-a-lifetime opportunity and today's achievement proves that our partnership with ESA was an excellent one," says Alphonso Diaz, NASA Associate Administrator of Science. The Cassini-Huygens mission is a cooperation between NASA, the European Space Agency and ASI, the Italian space agency. The Jet Propulsion Laboratory (JPL), a division of the California Institute of Technology in Pasadena, is managing the mission for NASA's Office of Space Science, Washington. JPL designed, developed and assembled the Cassini orbiter. "The teamwork in Europe and the USA, between scientists, industry and agencies has been extraordinary and has set the foundation for today's enormous success," concludes Jean-Jacques Dordain. The European Space Agency says the Huygens space probe has successfully transmitted scientific data from Saturn's moon Titan. Officials say the probe, operated jointly by the American, European and Italian space agencies, is continuing to transmit data after landing on the moon's surface earlier Friday. Huygens is studying the composition of Titan's atmosphere and relaying the information to the probe's parent craft, Cassini, for transmission to Earth. European space officials say the probe will continue to transmit data over the next few hours. It takes about one hour for the signal to travel from the probe back to Earth. Scientists believe conditions on Titan are similar to those here on Earth before life evolved, which could help them understand the origin of our atmosphere. (CNN) -- After a seven-year journey, NASA's Cassini probe has become the first spacecraft ever to orbit the giant ringed planet Saturn. Cassini entered orbit shortly after midnight Wednesday ET (0400 GMT Thursday) after threading a gap between two of Saturn's rings. The maneuver brought Cassini within 12,500 miles (20,112 kilometers) of Saturn's cloud tops. "It was kind of a nail biter throughout," said Cassini program manager Robert Mitchell. "What you saw here was the result of a lot of work on the part of a lot of people, and it all paid off just perfect." But the first images of Saturn's rings may not be something to write home about, Mitchell warned. "We're going to have pictures of the rings. What will they look like? Well, we really don't know," he said. "For somebody wanting to look at the 'gee-whiz' kind of picture, we might not have that." Earlier, there were cheers at Mission Control when the craft began a 95-minute engine burn to slow it down and place it into orbit. The craft risked shooting past Saturn if the burn failed. Cassini has spent the last seven years making a 2.2 billion-mile journey to study Saturn's atmosphere, magnetic field and weather patterns -- including its lightning and stormy ammonia clouds. "It's going to be the star of the show for the next four years," Mitchell said. Saturn, the second-largest planet in our solar system, has intrigued scientists for centuries. Its unique atmosphere and the wild chemistry on its many moons could shed light on how the planets -- and possibly life -- formed in our solar system. The $3.3 billion craft will train its 12 scientific instruments on the planet and moons over the next four years. In December, it will deploy a probe, called Huygens, to land on Saturn's largest moon, Titan. That moon may hold chemical clues to how life began on Earth. The craft also will send back the closest images ever taken of the rings -- consisting of ice, rock and dust -- orbiting the gas-giant. But first, Cassini needed to navigate a hazardous passage through those rings and insert itself into orbit, at times passing just 12,000 miles or so above the clouds of Saturn. To ward off dust-size particles as it passed through the rings, Cassini's main antenna acted as a shield during the 98,500-mile (158,000-km) transit. Afterward, Cassini fired its main engine for 95 minutes -- a minute less than planned -- to slow down to slide into orbit around the planet. On December 24, it will deploy Huygens, a saucer-shaped probe now attached to the spacecraft. That 705-pound probe will plunge through the atmosphere of Titan, one of Saturn's moons, and reach the surface before shutting down. Huygens will peer beneath layers of smog that shroud the moon with an atmosphere surprisingly similar to Earth's -- 4 billion years ago. Titan's nitrogen-rich atmosphere, possible seas of liquid ethane and tar-like permafrost are thought to resemble conditions on early Earth. Scientists hope Titan will have the same organic compounds that led to life on primordial Earth and will shed new light on how the planets and life evolved. "We may find some highly complex molecules that may have been on Earth long before there was life here," said Jean-Pierre Lebreton, project scientist for the European Space Agency's Huygens probe. "Going to Titan now is like going to Earth and going back in time." The Cassini mission is one of the most advanced and ambitious ever attempted. The interplanetary spacecraft was designed to be the most "sophisticated and reliable ... spacecraft ever built for exploration of the planets," NASA said. At 22 feet long and 13 feet wide, weighing nearly 12,600 pounds loaded with fuel and the Huygens probe, it is also one of the largest. Its propellant load alone has more mass than both Voyager I and II combined, two craft that preceded Cassini's visit to Saturn about 20 years ago. The electronic brain of Cassini, a sophisticated computer directing its movements, is now a standard feature on spacecraft. It uses a relatively new family of integrated circuits -- the first civilian application of this technology -- that is 10 times more efficient than previous spacecraft at just a fraction of the size. Cassini's journey to Saturn began at a meeting between European and American scientists in 1982. The Saturn orbiter and Titan probe were conceived as a mission that would benefit the scientific and, technological sectors of the scientists' respective countries. Seven years later, the U.S. Congress approved funding for the Cassini mission and Cassini-Huygens was launched in 1997. However, the original design process -- aimed at producing multiple spacecraft with standardized components -- was dramatically scaled back. Engineers eliminated most of Cassini's moving parts in favor of simplicity. The designers replaced tape recorders with solid-state recorders, installed gyroscopes without spinning components and dropped an articulated antenna arm for one bolted to the spacecraft. This reliance on nonmoving components meant Cassini must rotate its entire body in order to communicate with Earth or collect data by aiming its instruments. These acrobatics are accomplished with two main engines (one as a backup) and 16 smaller thrusters controlling the craft's orientation. But it also lessens the risk of problems on the spacecraft. NASA also designed Cassini to be independent because the time lag of one hour and 24 minutes -- the time for light to travel 930 million miles from Saturn to Earth -- means controllers on Earth cannot immediately react to unexpected problems. Instead, Cassini operates on its own. "The spacecraft has been programmed to continue even in the event of an emergency," said Mitchell in a statement. "We don't want Cassini to call home if a problem arises, we want it to keep going." That forced engineers to give Cassini an "inner ear," or computer software, that recognizes the spacecraft's orientation at all times. It gauges its position in space, as well as its location relative to the Earth, sun, Saturn and stars. To stay warm, Cassini also sports nuclear-powered heaters for cold interplanetary nights. More than two dozen layers of insulation wrap the spacecraft's sensitive innards from frigid space and meteorites. The spacecraft also carries a DVD record of 616,400 handwritten signatures from 81 countries around the globe, including the mission's namesakes, Jean-Dominique Cassini and Christiaan Huygens, lifted from 17th-century letters. On Cassini's four-year mission, it will make 52 close encounters with a handful of Saturn's 31 moons and orbit Saturn 76 times. SATURN: Planet second in size to Jupiter with a diameter of 74,898 miles (120,511 km). Seven rings of ice and rock particles with 31 known moons. Visited by Pioneer 11 (1979), Voyager 1 (1980), Voyager 2 (1981). TITAN: Largest Saturnian moon. May harbor organic compounds similar to those predating life on Earth. Temperature is minus 290 degrees Fahrenheit. CASSINI ORBITER: Launched Oct. 15, 1997. Spacecraft is 22 feet long and weighs 12,593 pounds (5,667 kg). Runs on nuclear power. Will orbit Saturn 76 times over four years. HUYGENS PROBE: Spacecraft is 8.9 feet in diameter and 705 pounds (317 kg). Will be released from Cassini on Dec. 24 and enter Titan's atmosphere on Jan. 14. MISSION COST: $3.3 billion, shared by NASA, ESA, Italian Space Agency. Clumps seemingly embedded within Saturn's narrow, outermost F ring can be seen in these two Cassini narrow angle camera images taken on Feb. 23, 2004 from a distance of 62.9 million kilometers (39 million miles). The images were taken nearly two hours apart using the camera's broadband green filter, centered at 568 nanometers. Image scale is 377 kilometers (234 miles) per pixel. The core of the F ring is about 50 kilometers (31 miles) wide, and from Cassini's current distance, is not fully resolvable. Contrast has been greatly enhanced, and the images have been magnified, to aid visibility of the F Ring and the clump features. The images show clumps as they revolve about the planet. Like all particles in Saturn's ring system, these features orbit the planet in the same direction in which the planet rotates. This direction is clockwise as seen from Cassini's southern vantage point below the ring plane. Two clumps in particular, one of them extended, can be seen in the upper part of the F ring in the image on the left, and in the lower part of the ring in the image on the right. 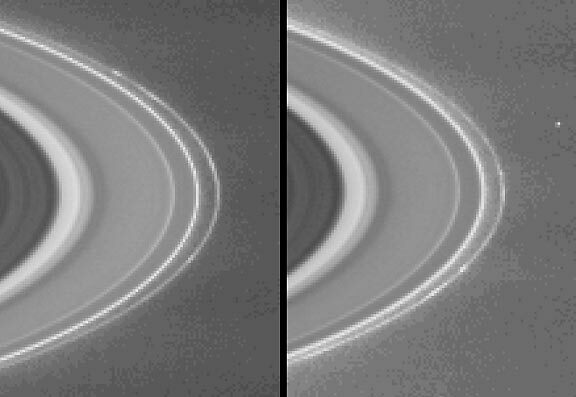 Other knot-like irregularities in the ring's brightness can also be seen in the right hand image. Clumps such as these were first seen when the two Voyager spacecraft flew past Saturn in 1980 and 1981. It is not certain what causes these features, though several theories have been proposed, including meteoroid bombardment and inter-particle collisions in the F ring. The Voyager data suggest that while the clumps change very little and can be tracked as they orbit for 30 days or more, no identified clump survived from the Voyager 1 flyby to the Voyager 2 flyby nine months later. Thus, scientists have only a rough idea of the lifetime of clumps in Saturn's rings - a mystery that Cassini may help to answer. The small dot at center right in the second image is one of Saturn's small moons, Janus (181 kilometers, 112 miles across). Janus was discovered by ground-based astronomers in 1966, and was first resolved by the Voyager 1 spacecraft in 1980. The moon shares almost the same orbit with another small satellite, Epimetheus. Janus and Epimetheus, both thought to consist mostly of porous ices, play a role in maintaining the outer edge of Saturn's A ring. For information about the Cassini-Huygens mission, http://saturn.jpl.nasa.gov and the Cassini imaging team home page, http://ciclops.org. Earthlings bid farewell to the Cassini spacecraft tonight as the Saturn-bound mission successfully completed a highly accurate pass of Earth at 8:28 p.m. Pacific Daylight Time (03:28 Universal Time August 18). The flyby gave Cassini a 5.5-kilometer -per-second (about 12,000-mile-per-hour) boost in speed, sending the spacecraft on toward the ringed planet more than 1 billion kilometers (almost one billion miles) away. Engineers at NASA's Jet Propulsion Laboratory confirmed that the spacecraft flew past Earth at an altitude of about 1,171 kilometers (727 miles), passing most closely above the eastern South Pacific at -23.5 degrees latitude and 231.5 degrees longitude. Cassini may have been visible from small islands in that area, such as Pitcairn Island or Easter Island. The spacecraft remains in excellent health as it continues along its seven-year-long journey to Saturn. Having completed its cruise among the inner planets, Cassini's future now resides in the cold, dark realm of the outer planets. The spacecraft will pass by Jupiter on December 30, 2000; the giant planet's gravity will bend Cassini's flight path to put it on course for arrival into orbit around Saturn on July 1, 2004. Cassini's mission is to study Saturn, its moons, elaborate rings, and its magnetic and radiation environment for four years. Cassini will also deliver the European Space Agency's Huygens probe to parachute to the surface of Saturn's moon Titan. Titan is of special interest partly because of its many Earthlike characteristics, including a mostly nitrogen atmosphere and the presence of organic molecules in the atmosphere and on its surface. Lakes or seas of ethane and methane may exist on its surface. The Cassini/Huygens program is a joint endeavor of NASA, the European Space Agency and the Italian Space Agency. The Cassini orbiter, built by NASA, and the Huygens probe, provided by the European Space Agency (ESA), were mated together and launched as a single package from Cape Canaveral, Florida, on October 15, 1997. Cassini's dish-shaped high-gain antenna was provided for the mission by the Italian Space Agency. At Saturn, the Huygens probe will detach from Cassini to parachute to the surface of Titan on November 30, 2004. Nine of Cassini's 12 science instruments were turned on to make observations of the Earth/Moon system. Scientific and engineering data from the Earth flyby will be transmitted by Cassini to receiving stations of NASA's Deep Space Network over coming days. LOS ANGELES (AP) -- The plutonium-powered Cassini spacecraft flew within 728 miles of Earth's surface, successfully using the planet's gravity to gain speed and change direction for the final stretch of its journey to Saturn. NASA's most expensive unmanned spacecraft made its closest approach to Earth late Tuesday, arriving within three miles of its target and six-tenths of a second late -- all within an acceptable margin of error. ``It was right by the book,'' said Bob Mitchell, Cassini's program manager at NASA's Jet Propulsion Laboratory in Pasadena. But concern over the safety of nuclear-powered spacecraft are not likely to diminish as the $3.4 billion Cassini speeds away. Anti-nuclear activists plan to protest any future missions that use radioactive materials. Activists had feared that human error or some other mishap could fling Cassini and its 72 pounds of radioactive plutonium into Earth's atmosphere. A handful of demonstrations took place in June to protest the flyby, but most activists conceded nothing could be done to prevent it. Before Cassini's launch, protesters filed lawsuits and threatened to chain themselves to the pad. NASA experts said there was only a 1-in-1.2 million chance of accidental re-entry. And even if that happened, the plutonium was well-protected, they said. The robotic probe reached its closest point over the southeastern Pacific Ocean as expected at 8:28 p.m. The spacecraft's closest point was nearly 110 times higher than commercial jets normally cruise. The swingby was designed to give the spacecraft momentum for the remainder of its trip, and the mission would have been impossible without the gravity assistance of Earth and other planets, Mitchell said. Cassini has twice used the gravity of Venus to increase its speed since its launch in October 1997. In December 2000, it will swing by Jupiter for a final push toward Saturn and its moons, which the probe will study for four years beginning in 2004. NASA has used ``gravity assists'' of Earth and Venus since 1973 to fling other spacecraft to their destinations, including the successful -- and plutonium-powered -- Galileo probe to Jupiter. Galileo twice flew close to Earth without incident. Cassini doesn't use the plutonium for propulsion but to power its dozen instruments. Heat from the naturally decaying element is converted into electricity in the craft's three nuclear batteries. Once it arrives at Saturn, Cassini will make close-up studies of the planet, its rings, moons and magnetic environment. It also will release a European Space Agency probe named Huygens, which will parachute to the surface of Titan, Saturn's biggest moon. Cassini passes Earth on way to Saturn PASADENA, Calif., Aug. 17 (UPI) - NASA's Cassini spacecraft flew by Earth (Tuesday), using the planet's gravity to pick up a boost of speed that placed the probe on target for a rendezvous with Saturn in 2004. Scientists at the Jet Propulsion Laboratory in Pasadena, Calif., managers of the international robotic mission to the ringed planet, confirmed that the probe whisked by Earth on schedule at 8:28 p.m. PDT. The six-ton Cassini spacecraft was launched from Cape Canaveral, Fla., in October 1997 and was returning from two flybys of Venus when it passed within 725 miles of Earth. Criswell predicts, what he calls a "black rainbow"
But Nasa officials insist Cassini's return poses virtually no risk. It will come within 725 miles (1,165km) of the Earth in the early hours of Wednesday morning and use the planet's gravity to gain momentum for its trip to Saturn. according to a Nasa estimate. Mission officials say that for re-entry to occur, a failure aboard the probe would have to cause an exact change in its speed before the flyby. Then something would have to happen to prevent Nasa from transmitting corrective orders. "We've been flying this thing for two years now and we got a lot of practice," said Cassini programme manager Bob Mitchell. Scientists have been planetary "gravity assists" since 1973 to fling probes around the outer solar system. "It's purely gravity and no more sophisticated than the moon moving around the Earth," said Mr Mitchell. They saw it as a ball of poison. Across the world, they yelled and held up banners to protest its flyby of Earth. They said the craft, careening through space at 42,000 miles per hour, had a good chance of slapping into the Earth's atmosphere and spreading dangerous radiation throughout the planet. In protests, on Web sites, in papers, and in speeches, they claimed that thousands, even millions, could die. On early Wednesday morning the Cassini probe, carrying 72 pounds of radioactive fuel, whizzed by Earth -- without incident -- on its way to Saturn. Come launch time -- in October 1997 -- the protesters staked out the Cape Canaveral launch site to try to stop the probe. The launch went off without a hitch. And when the craft was on its way back to Earth after spiraling around Venus for a gravity boost, the opponents once again unfurled their banners. Jonathan Mark was one of the protest leaders. His website, "Stop Cassini Earth Flyby," was a kind of Protest Central for opponents of the craft. On it, there are impassioned pleas to stop the mission with headlines like "NASA Misleads the World," and "The Cassini Gamble." There are links to scholarly papers on the risks of the mission to the planet and its inhabitants and to political dispatches decrying the military's role in space research. You can sign up for legal action and send off thoughts to world leaders. And you can view pictures of the worldwide protests: of grandmothers making their voices heard, and Bangladeshis taking a stand. But now that Cassini passed by safely, was it all for naught? "Protesting against Cassini wasn't a mistake," Mark said. "It's significant, and I'm glad there wasn't any accident." Mark, who sends his anti-Cassini newsletter to over 1,000 subscribers, still believes that plutonium-powered spacecraft could one day play a role in destroying life on Earth. "We're living at a time when human beings don't have to survive on this planet," he said. "We can go extinct like the dinosaurs." On the other side of the world, the General Secretary of the Bangladesh Astronomical Society had a similar reaction. "Our calculation was not wrong, because we did not say that it would definitely fall on the Earth during its closest approach with Earth," F.R. Sarker said. "We were more concerned about the radioactive materials Cassini has been carrying on board." NASA, on the other hand, couldn't resist a little gloating. "We told you so," chimed in Mary Beth Murrill, spokeswoman for NASA's Jet Propulsion Laboratory in Pasadena, California, when asked what she would say to the anti-Cassini protesters. The space agency had said all along that a disaster was extremely unlikely, with a probability of less than one-in-a-million. Another NASA spokesman, Douglas Isbell, said the protesters' concerns were legitimate, but that mission scientists had taken extra precautions to prevent an accident. NASA is planning eight more missions that will rely on the same kind of plutonium power generators used on Cassini, Isbell said. Radioisotope thermoelectric generators, or RTGs, power Cassini. They are primarily used on missions to the outer solar system, where the sun's rays are too weak to be a usable source of power. RTGs rely on the heat produced as plutonium, a radioactive element, decays. A converter changes that heat into electricity, which powers the craft. The next launch of an RTG-powered craft is scheduled for the end of 2003, the Europa Orbiter, which will study a moon of Jupiter. Those future launches are keeping protesters from packing up their signs. "Concern about future plutonium launches is my main concern," Mark said. He plans to leave his website up as a reminder of the Cassini protests, though daily updates will probably stop. And in Bangladesh, the Cassini probe's success has left a residue of worry. "It is true, we are lucky as there was no accident with Cassini," said Sarker, whose group led an anti-Cassini protest march on June 18. "But we are unlucky because this would encourage NASA to launch more space probes in the future with plutonium dioxide until an accident really takes place." LOS ANGELES Mar 9, 2006 (AP)� The orbiting Cassini spacecraft has spotted what appear to be water geysers on one of Saturn's icy moons, raising the tantalizing possibility that the celestial object harbors life. The surprising images from the moon Enceladus represent some of the most dramatic evidence yet that water in liquid form may be present beyond the Earth. Excited by the discovery, some scientists said Enceladus should be added to the short list of places within the solar system most likely to have extraterrestrial life. Scientists generally agree several ingredients are needed for life to emerge, including water in liquid form and a stable heat source. But so far, the evidence of any large amounts of water in liquid form on celestial objects beyond Earth is circumstantial and indirect, based on scientists' analysis of rocks and other data. Cassini recently snapped high-resolution images showing geyser-like eruptions of ice particles and water vapor at Enceladus' south pole, scientists said. The pictures do not actually show any water in liquid form, but scientists believe the ice and vapor must be coming from underground reservoirs of water close to the surface. Torrence Johnson, a Cassini scientist at NASA's Jet Propulsion Laboratory in Pasadena, said this marks the first time that scientists have seen evidence of water in liquid form so close to the surface on another body beyond Earth. David Morrison, a senior scientist at NASA's Astrobiology Institute, cautioned against rushing to judgment about whether the tiny moon could support life. "It's certainly interesting, but I don't see how much more you can say beyond that," Morrison said. Scientists believe Mars and Jupiter's icy moons might have or once had conditions hospitable to life. But the evidence of water is indirect. In the case of Mars, scientists have never seen any flowing water. But based on their study of rocks, they believe water once existed there. They say magnetic readings of Jupiter's moon Europa strongly suggest that it has an ocean of water, covered by ice. Saturn is around 800 million miles from Earth. Enceladus measures 314 miles across and is the shiniest object in the solar system. Enceladus was long thought to be cold and still, in part because it receives so little sunlight. But scientists now believe it is a geologically active moon that possesses an unusually warm south pole and a significant atmosphere. The south pole "hot spot" is still frigid by Earth standards. The temperature there is minus-297 degrees about 20 degrees warmer than the neighboring region. The water is believed to come from underground reservoirs that are under high pressure. Porco said the venting has probably been going on for at least several thousand years, perhaps indicating a lasting heat source underground. Cassini found the geysers are mostly made up of water vapor and ice particles with significant amounts of carbon dioxide and trace amounts of methane all of which probably help to replenish the moon's atmosphere. The Cassini-Huygens mission is a joint NASA-European Space Agency project. The spacecraft was launched in 1997 and went into orbit around Saturn in 2004, exploring its spectacular rings and many moons. Cassini made three flybys of Enceladus last year and is expected to fly within 220 miles of the moon again in 2008. The new view shows some of the smooth plains noted in Voyager and earlier Cassini images. At about the 7 o�clock position are interwoven lineament patterns that are reminiscent of the wispy-terrain features on Dione and Rhea.